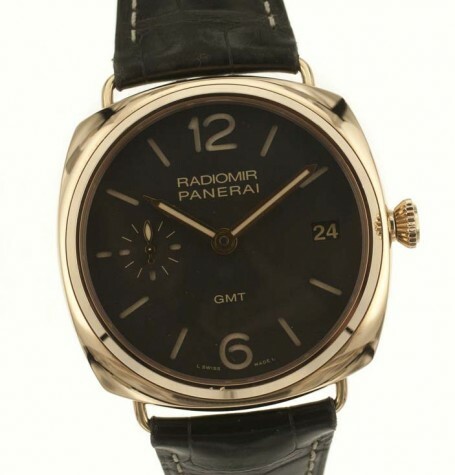 This Panerai Radiomir 421 3 day GMT in rose gold is a spectacular watch by any measure. 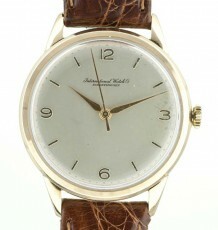 Starting with the imposing 47mm polished rose gold case and massive tobacco coloured dial. 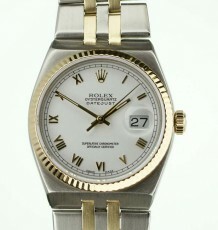 The watch exudes wrist presence. 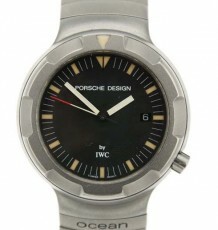 A slight nick on the 6 o’clock side of the bezel is visible in the photos. 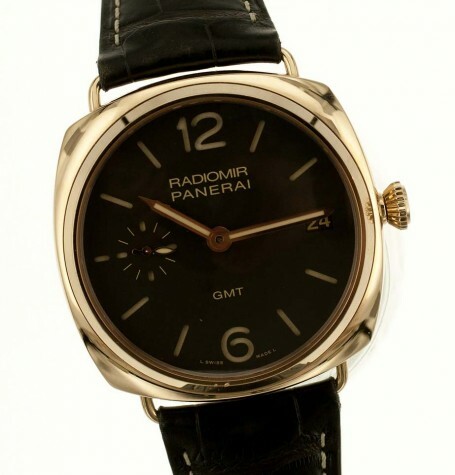 Rather than try to polish this off we have left the case of this Panerai Radiomir 421 all original. The mark is not significant and one that is likely to appear during anyone’s ownership of a similar watch. 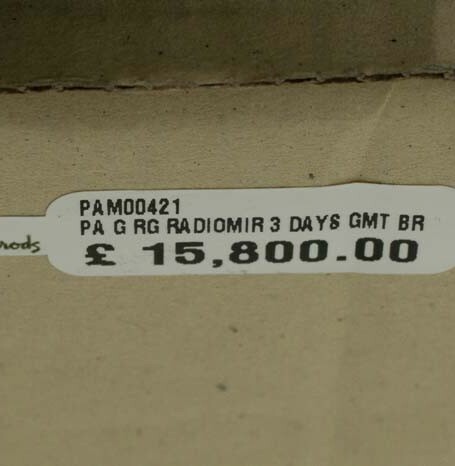 The price reflects the presence of the mark. 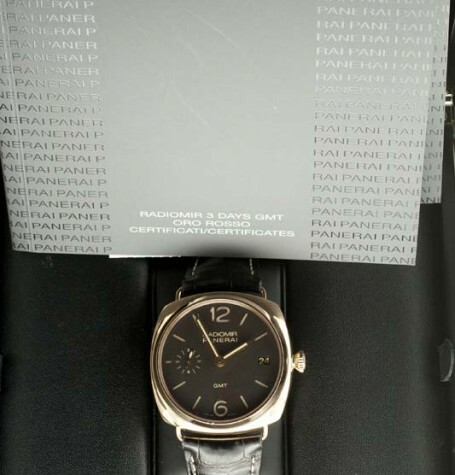 The case features the original Officine Panerai signed screw-down crown. 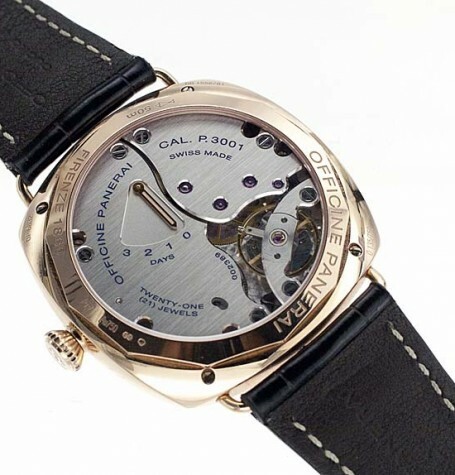 The see-thru sapphire case back reveals the inner workings of the in house Panerai P.3001/10 calibre manual wind movement. 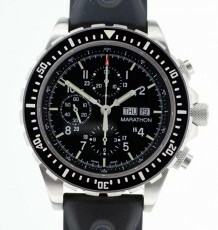 The movement also features a power reserve display illustrating just how many of the 3 days power reserve you have left. 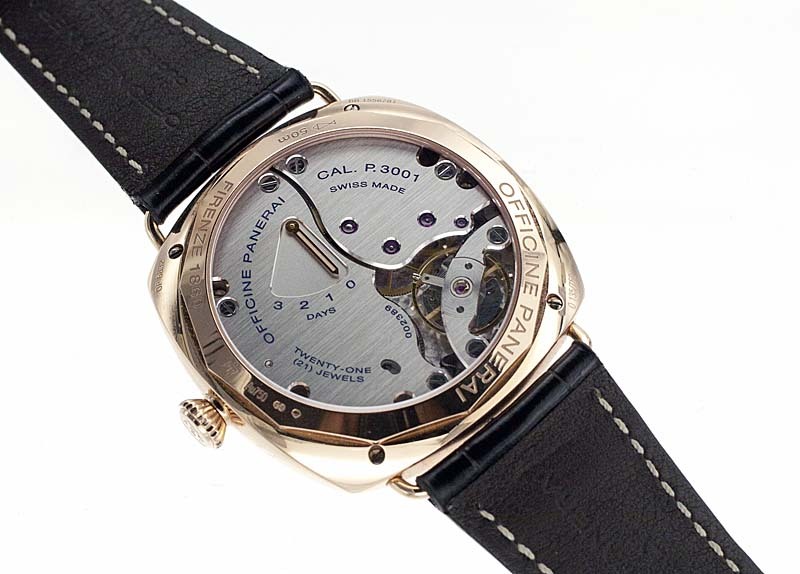 The P3001/10 movement features 21 jewels, two barrels and over 200 individual parts. The original signed dial is a model of simplicity with the normal sweep seconds, 3 hand arrangement but a subtle rose gold adjustable GMT hand discretely displays the second timezone of your choice. The luminous hours markers along with luminous filled hands provide excellent night time legibility. 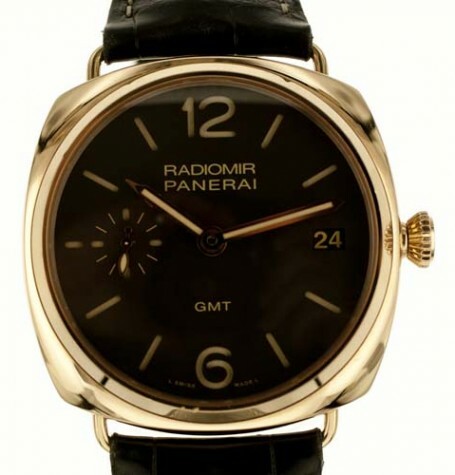 The famed Panerai Radiomir cushion case with screw down crown, provides water resistance to 50 metres. 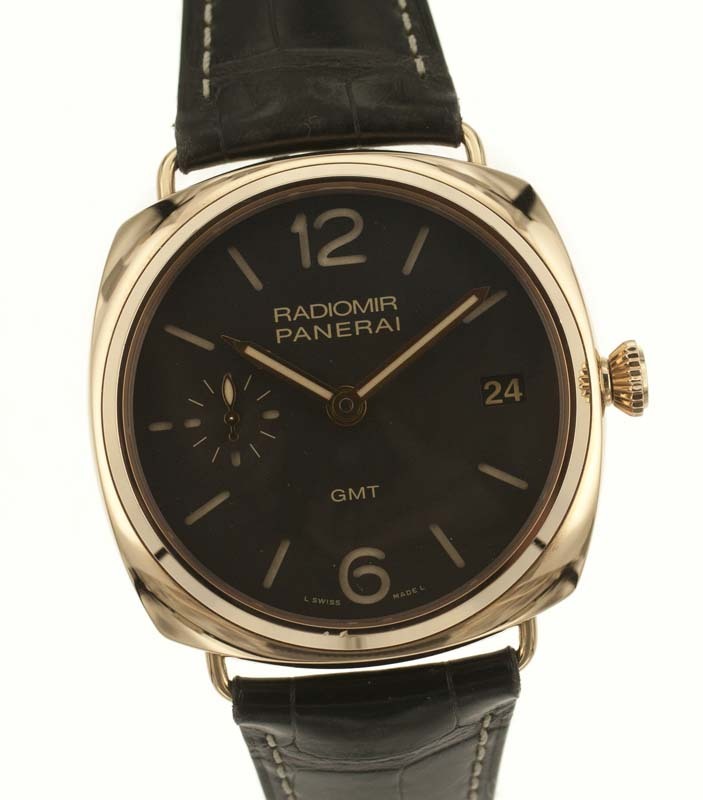 The watch is supplied on a genuine Panerai black alligator strap with signed rose gold buckle. 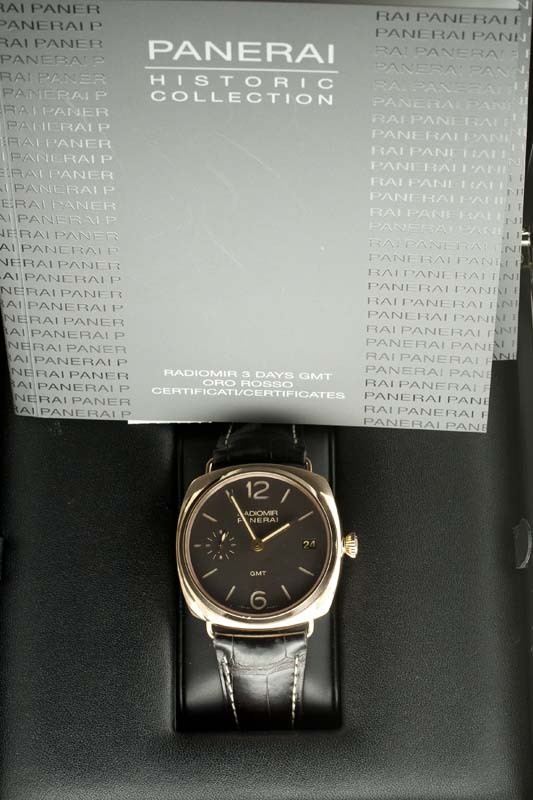 The original boxes, tags and paperwork comes with the watch. 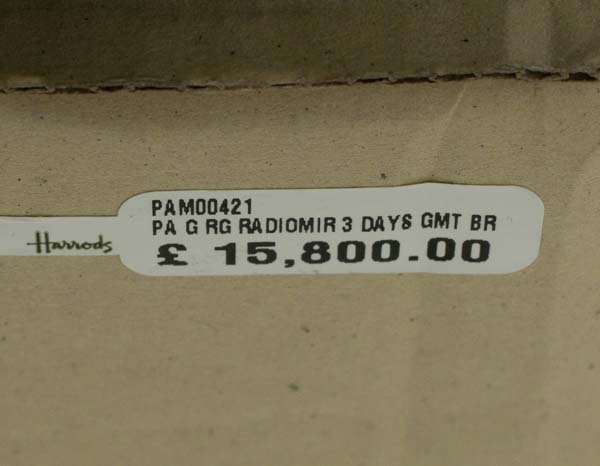 Also interesting is the original price tag on the exterior cardboard box showing the original Harrods, UK price sticker. Due to the price of this item we can only accept wire transfer in US dollars as payment.